Knowing how defensive people can get about their favorite companies and OSs, let me start by saying, this is an opinion piece. Using news and facts yes, but my conclusions are my own. If you don’t agree, think I’m misinterpreting, leave a comment. Way back in August, I wrote an article discussing why Windows tablets have a chance. At the time, we’d seen images of the new Windows 8 operating system, and I predicted that Microsoft would offer transforming devices, which would use the new interface on tablets but move to full desktop Windows when plugged into a mouse and keyboard setup. I predicted that that extra capability to use full Windows would give Windows Tablets the ability to succeed where the iPad has failed, namely, enterprise. Now that the Windows 8 Consumer preview has been out for a while and I’ve gotten a chance to use it, I’d like to revisit the topic. Not to review Windows 8 specifically, there are numerous reviews out there already. Rather, we’re going to take a general look at where Windows is headed, what Microsoft is doing right, and more important, what Microsoft is doing wrong. My predictions last August were close, but unfortunately not spot on. I predicted the Metro interface would be default on tablets, switching to the full desktop given a docking setup. Microsoft decided to go one step further, giving the user the ability to switch between both, at any time, on any setup. I also predicted that applications would work and carry over between interfaces, just using the different look and feel of the given interface. That prediction seems to have been off oppositely. While most big applications will work on both interfaces, it will be different program instances. And with the ARM version of Windows 8, all current desktop applications will have to be re-written just as completely as their metro counterparts. Goodbye smooth transition. Back when I predicted that having both desktop AND metro would be a good thing, it was because I assumed that the metro would ONLY be used on touchscreens, while the desktop would ONLY be used on desktop/laptop setups. The way it’s currently set up is utterly unnecessary, and in fact overly confusing to many desktop users who aren’t techies. The traditional Desktop interface is almost perfect with a keyboard and mouse setup. Microsoft and Apple have been optimizing and perfecting it for nearly 2 decades. Yet just as it’s great on that setup, it’s a failure on a touchscreen. This it’s prediction; it’s been proven time and again whenever Microsoft tried to sell a Windows tablet. They are falling into the very same mistake as before. People don’t want Windows (desktop) on a touchscreen. Metro is beautiful, and on a touchscreen it’s incredibly intuitive. It works well, and it’s the first major touchscreen UI that is both easy to use, and not a copy of iOS (sorry Android fans). But yet similarly to the desktop, as great as it is on touchscreens, it’s not great at all using a mouse/keyboard setup. We have two different user interfaces, built for two completely different input devices. Microsoft is trying to ramrod them together, unnecessarily. While I might be biased, I do think that my original predictions would actually be smarter for Microsoft than the path they seem to be one. Namely, stop trying to force separate UIs into places they don’t belong. Best case scenario: Take Metro out of x86 Windows 8. Let it be the next version of the regular desktop/laptop Windows. Then Windows 8 on ARM though, should default to Metro, because it’ll only be on tablets or transformers. Either leave it as solely a Metro interface, and go the Apple route, or offer the desktop as a separate mode, but only when attached to a mouse/keyboard. Without those, it’s unneeded anyway. 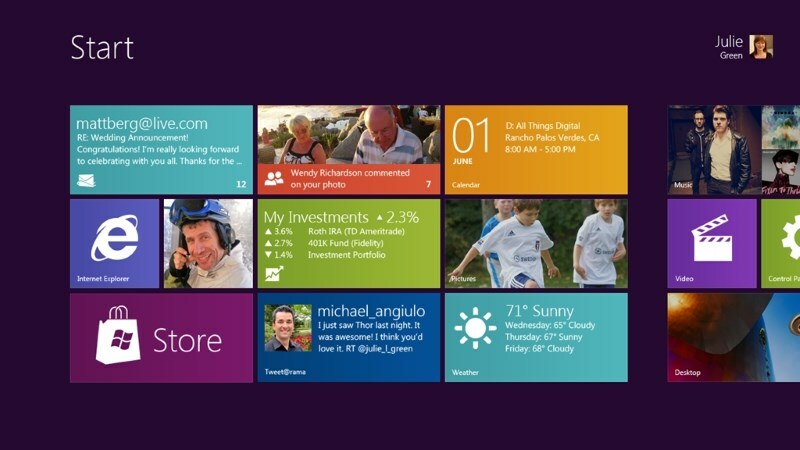 Enterprise and non techies still get all the desktop enhancements of Windows 8. Tablet users get the beautiful new Metro tablets. Microsoft gets the profits from both, and goodwill of users who actually get a choice.